When a young nun dies mysteriously in Romania, the Vatican decides to send Father Burke (Demián Bichir) and a novitiate to investigate the death in the abbey. 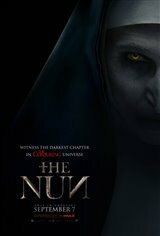 Together, they risk their lives and their souls as they confront a malevolent force that takes the form of a demonic nun. Soon, the abbey becomes a battleground between the living and the damned.